"Here's a paradox a most ingenious paradox: an anthropological fact many Christians may have much more Hebrew-Israelite blood in their veins than most of their Jewish neighbors." Could this possibly be so? If so it would mean that the majority of Christendom and the rest of society has misidentified the people most prominent in the Bible. If Israel has been misidentified there is no doubt that major errors in doctrinal interpretation and application of biblical prophecy have been made! Take a close look at an 1880 reprint of Dan- The Pioneer of Israel. Denmark = Danmark = Tribe of Dan! The book focuses on the Tribe of Dan's early enterprises and their settlements and connections with the Scythians. Traces the Danaans or Danes of Scandinavia, Ireland and Scotland back to the Tribe of Dan.The Tribe of Dan by its enterprise and vigour has made itself one of the most conspicuous branches of Jacob's family. Its ancestor was the son of one of the concubines and was the firstborn of Rachel's household. "God has judged me" said Rachel and she called his name "Dan" which means to judge to rule; and this word perhaps on that occasion first started as a surname has been perpetuated as a title in the Gothic Anglo-Saxon and English. In these languages Din Dun Don and Dan signify ruler master. The expression is repeatedly used by Shakespeare Spenser Chauser Prior and others. The Spanish too from close contact for ages with the Hebrew has engrafted it in their title of Don; it is in use in the universities to designate a professor or university official. How often do we see in the Bible that the name of an individual foreshadows the character and career. 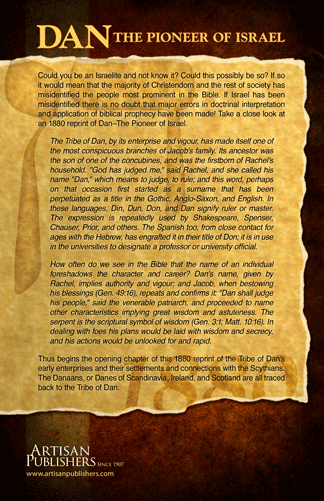 Dan's name given by Rachel implies authority and vigour and Jacob when bestowing his blessings (Gen. 49:16) repeats and confirms it: "Dan shall judge his people" said the venerable patriarch and proceeded to name other characteristics implying great wisdom and astuteness. The serpent is the scriptural symbol of wisdom (Gen. 3:1; Matt. 10:16) : In dealing with foes his plans would be laid with wisdom and secrecy and his action would be unlooked for and rapid. Thus begins the opening chapter of this 1880 reprint of the Tribe of Dan's early enterprises and their settlements and connections with the Scythians. The Danaans or Danes of Scandinavia, Ireland, and Scotland are traced back to the Tribe of Dan. 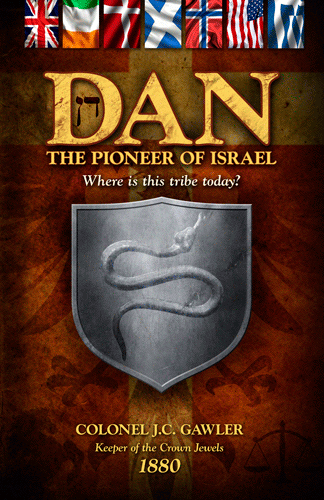 Colonel Gawler shows the connection between the Danai of Greece and the Danites of Israel and tells why he believes Dan was not sealed among the 144,000 in the Book of Revelation.